The former regeneration adviser to Ken Livingstone is up in court this week accused of siphoning off cash meant to promote sport, leisure and recreational activities in poorer areas. A commuter service from Cambridge to London has been 'named and shamed' as the most overcrowded in Britain. Guerilla gardeners are targetting neglected public areas in central London. Just last week Westminster Bridge had its traffic islands brightened up a bit. One of the runners in next month's London Marathon will be warming up by jogging to the starting line from Scotland. Wow, the trains must really be bad. William Hill are currently offering 33/1 odds that Chelsea will end the season without winning a trophy and 7/1 that Mourinho will have left the club by the first day of next season. Not a bad bet we reckon. 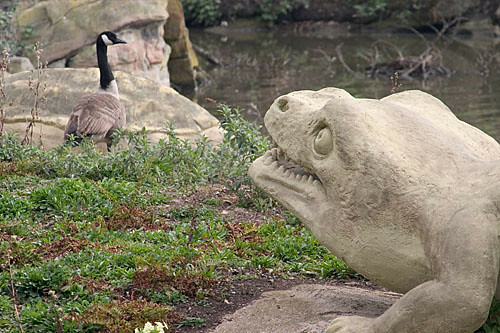 Photo of Labyrinthodon dinosaur stalking a Canadian Goose at Crystal Palace courtesy of eye say via the Londonist Flickr group.